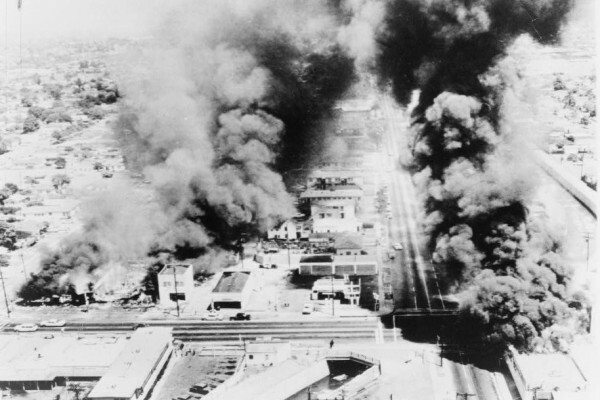 Riots erupted in the African American neighborhood of Watts 50 years ago on August 11, after the arrest of a young black motorist, his mother and brother. The violence came out of frustration with not only the police, but also the lack of economic opportunities and fair housing. Those same problems plagued the Inland Valley, Rev. Cecil Murray told the Inland Valley Daily Bulletin for its story on the anniversary. At the time of the riots, Murray was senior pastor of Primm African Methodist Episcopal Church in Pomona and chairman of the Pomona Valley Congress of Racial Equality. The congress met with bankers to push them to give out loans to people of color, but they “said they felt no great obligation to the minorities in the city,” Murray said. Now the chair of the Cecil Murray Center for Community Engagement, Murray was pastor of First African Methodist Episcopal (FAME) Church in Los Angeles during the 1992 civil unrest that followed the acquittal of the police officers involved in the Rodney King beating. Jackson noted that Watts’ future now depends on the Latino community, as Latinos are now the majority in the area. In both interviews, Murray noted progress made in the last 50 years, including a rise in civic engagement and civil right activism. After the beating of Rodney King, the L.A. Police Department added an inspector general as an independent watchdog who audits and investigates the department’s handling of complaints of employee misconduct. Still, he told the Inland Valley Daily Bulletin that he’s hopeful with what he sees online, with social media efforts to shine the spotlight on racism and abuses of power. “You can see some positives, so you can’t be too cynical,” Murray said.